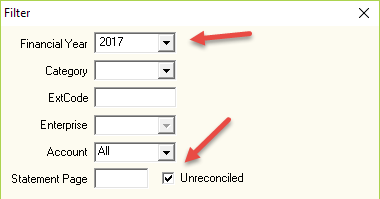 The Filter button helps you to find and view specific pieces of information in your database such as looking at last year's transactions. It is available in all screens of Cashmanager and depending on what screen you're in, the Filter button will have different filter options. TIP: Once you have finished using the filter, click on the Filter Clear button to revert back to your original view. Steph runs through the end of year checklist for the 2017 financial year before handing her books to her accountant to process, and one of the items she needs to check is that there aren't any unreconciled transactions. To do so, she clicks on the Filter button and enters the search criteria as below. Once Steph has dealt with any unreconciled transactions, she clicks on the Filter Clear button to revert the Transaction screen back to its normal view. 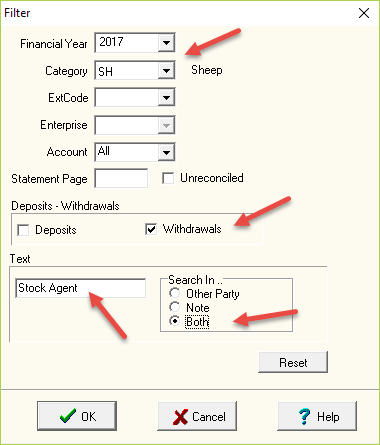 Tom wants to find all sheep purchase transactions that were handled through his Stock Agent and that occurred in the 2017 financial year. To do so, he clicks the Filter button and enters the search criteria as below. DID YOU KNOW? You can view and change the filter parameters while you're in the Transaction List report. This report lets you print out the view in your Transaction screen. Filter by Enterprise. Note only one Enterprise can be selected at each time. The employee's entire employment history or after a specific Pay Period End Date. Additionaly in this screen, if you highlight a customer and click on the Filter Debtor button all invoices and payments for the customer will appear on screen.